If you are new, take time to get to know us and what we are all about. Many of us have grown up in other faiths and have found comfort in the feeling of warmth, safety and openness our congregation offers. Some have always known Unitarian Universalism and its culture of free expression and differing points of view. 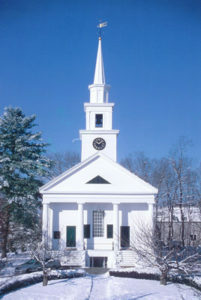 We are proud that the Unitarian Church of Sharon is now recognized as a Welcoming Congregation by the Unitarian Universalist Association, creating greater awareness of issues affecting gay, lesbian, bisexual and transgender (GLBT) people and a welcoming attitude toward members of the GLBT community who visit or join our church. Our church is also fully accessible to the handicapped, with an elevator available at the new entrance on the side of the church. As you will notice on our home page, our services are Sundays at 10:00 a.m. for families (adults and children) and 10:30am for adults (while children attended religious education classes). These services are held weekly at the Meetinghouse, 4 North Main St., Sharon. There is parking beside the church, at the bank across Route 27, to the left of the church, or on the street. When you enter the church you will probably be met by a greeter. These greeters are on the Membership Committee and are more than happy to answer any questions you have about the church, our beliefs, the Religious Education program (Sunday School), upcoming events, or anything else you are curious about. You may also speak to our minister at any time. You may come as a visitor as long as you are comfortable. Later you may choose to become a Friend of the church or a full-fledged Member. Membership in the Unitarian Church of Sharon is open to anyone who agrees with our principles and purpose as a Unitarian Universalist congregation, and informs the Membership Committee of his or her intention to join. By becoming acquainted with our members at coffee hour after service and other fellowship events, such as those listed in the right-hand column of our home page. By reading The Chalice, our monthly newsletter. You can download the latest issue of The Chalice here. By inquiring of a Membership Committee member how and when you can participate in our “Introduction to Unitarian Universalism” and other informational classes. We also encourage you to regularly attend Sunday services (in whatever way is manageable for you and your family); to become involved in congregational activities that provide service to the church or the larger community; and to participate in a fellowship or educational event. Only members are eligible to vote at official church business meetings, held annually and perhaps one or two other times throughout the year. Directions: The Unitarian Church of Sharon is located at 4 N. Main St. (at the corner of Main St. and Depot St.) in Sharon. Get detailed directions and view a map. E-Mail Lists: Sign up for our two e-mail lists through which members and friends can receive announcements of church events and activities. 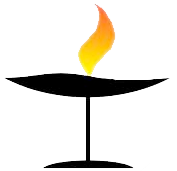 Membership: Find out how to become a member of the church and discover what being a Unitarian Universalist is all about. Newsletter: Download past issues of The Chalice, the monthly newsletter of the Unitarian Church of Sharon and a primary means of communication among church members. Family Service at 10:00 a.m. Adult Service at 10:30 a.m.
OFFICE HOURS: Please call first. The Ministerial Search Committee joyfully recommends the Rev. Joanna (Jolie) Olivetti to serve as our next settled minister. Jolie will lead worship on April 28th and May 5th. A Special Congregational Meeting will be held immediately after the May 5th service to vote on calling her. We need at least 50% attendance by members and at least an 80% “Yes” vote. Plan to be there! 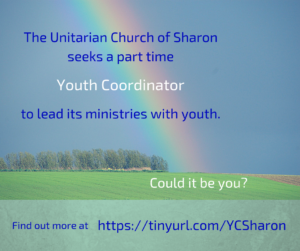 Contact Linda at admin@uusharon.org with any questions. We regularly collect toothbrushes, travel-size soaps, shampoos, conditioners, toothpaste, diapers (including adult sizes), etc., for the residents of Father Bill’s / MainSpring House. Special requests: adult-size shower shoes, combs, hair brushes and feminine care products. Brown Envelope Social Justice offerings in April will go to the Louis D Brown Peace Institute in connection with the Mother’s Day Walk for Peace (May 12). We will send a small team to the walk, even though it will take us away for the Sr Youth Service the same day…. 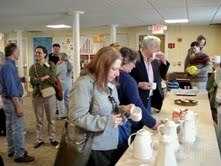 Not Just Another Coffeehouse On Sat., Apr. 20, at 7pm (doors at 6:30), we welcome our own All-Ireland harp champion Kathleen Guilday and fiddle virtuoso Laurel Martin and her daughter Sarah Martin for an evening of traditional irish and Scottish Music. Laurel and Kathleen are members of the renowned Childplay ensemble. $15 or what you can afford. Fair trade beverages and homemade desserts will be available for sale at intermission. Apr 21 10 and 10:30 Hope Springs Eternal Several indigenous peoples and some modern theologians understand the earth to be the body of God, the Mother of all life. This morning, as we celebrate both Easter and Earth Day, we reflect on what gives us hope. Apr 28 10 and 10:30 First Sunday of Candidating Week This will be our first chance to join in worship services led by our ministerial candidate, Rev. 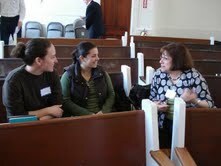 Joanna (Jolie) Olivetti, followed by an opportunity to get together with her after the service. More details about Jolie are on the home page of this website. May 5 10 and 10:30 Second Candidating Sunday Rev. Jolie Olivetti will lead worship again this week. A special Congregational Meeting will take place immediately following the worship service. Our bylaws require attendance by at least 50% of our members, with at least 80% voting in favor of the call. So your participation in this decision is important! Let’s Laugh Today Join us on the second Saturday of each month from 11am-12pm. Bring water to drink and a donation (non-perishable food for the Sharon-Stoughton Food Pantry or travel-size toiletries for Father Bill’s / MainSpring House). **PEANUT-FREE** Lunchmaking for MainSpring House All ages are welcome to help make the 100 peanut-free lunches we donate once each month. Remember to bring personal-size items like shampoo, soap, etc., to be delivered with the lunches. See special request notice for additional items. Recycling Opportunity Do you have gift cards that can’t be reloaded or expired credit cards you’ve sliced up? Our Social Justice Committee has found a recycler who will accept them. Bring them to the Social Justice table on Sundays. Meditation and Study Group NEW TIME We meet from 7pm – 8pm on Tuesdays, alternating personal seated meditation with other methods. Instruction is available and the group is always open to new participants. Book Group meets in the library at 7pm on the first Wednesday of most months from September through June. You are welcome to join us, even if you haven’t finished reading the book. See details elsewhere in this scroll. Shopping for Justice We purchase grocery cards at a discount and sell them at face value. The difference helps to fund our Social Justice work. Cards for Big Y, Shaw’s and Stop & Shop are available during coffee hour. We support the Ilsa Marks Sharon-Stoughton Food Pantry year-round (and are among the few organizations that do so). The need has continued to grow. Please leave your donations of non-perishable food in the entryway. Movie Night Join us at 7pm on the 2nd Friday of each month from September through June. Enjoy the movie, lively discussion and free popcorn. Need a Gift? Depending on store policy, you may be able to use Shopping for Justice grocery cards to purchase other types of gifts cards (e.g., for restaurants, department or home improvement stores, or online music vendors), thus extending our Social Justice programs. Conversations at the Meetinghouse Join us at 7pm each first Friday Oct. through June for a presentation and discussion about a topic of interest. See details elsewhere in this scroll, http://www.uusharon.org/happenings/conversations-at-the-meetinghouse/, or subscribe at http://www.uusharon.org/keep-in-touch/email-lists/subscribe-to-conv-announcements/.